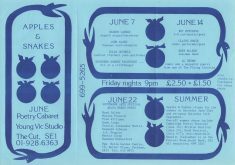 Thirty-five years of Apples and Snakes poetry shows: a lot of shows, a lot of artists. There are still a few gaps, but we're gradually uploading details of them all. Search away, using the boxes on the left. 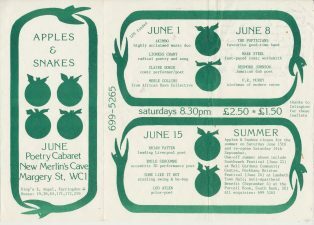 You can search by year (maybe you want to trace your first ever Apples and Snakes gig), by artist (from Dirg Aaab-Richards to Zk the Poet) or by venue (what was the name of that place with the really narrow staircase?). 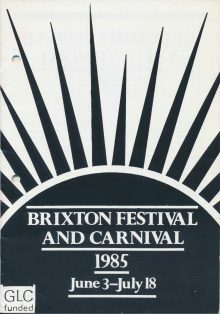 You'll see that there are some artists we don't know much about - maybe they did one gig for us in 1983 - and we'd therefore welcome any information that you might have. 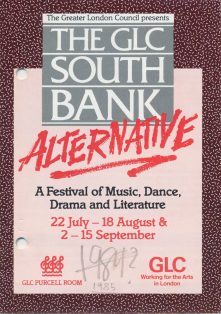 Even better, you might be that artist - and we'd be delighted to renew our acquaintance with you. And if you have details of any A&S shows that seem to be missing, we'd very much like to hear from you. Especially '80s and '90s; the last few years we've got covered (probably). 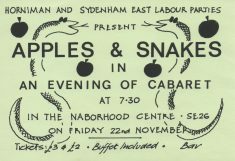 Apart from the great line-up and the great cause, this show surely boasts the best take on the ‘apple/snake’ motif to have graced an Apples & Snakes flyer. The circularity and the black/white symbolism are entirely appropriate, and that ‘apple of the eye’ is a touch of genius. A New Year’s Eve show in collaboration with the popular listings magazine City Limits. 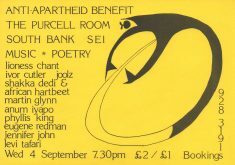 The line-up suggests that, at least in part, it wasn’t meant to be the usual kind of New Year feelgood fare.